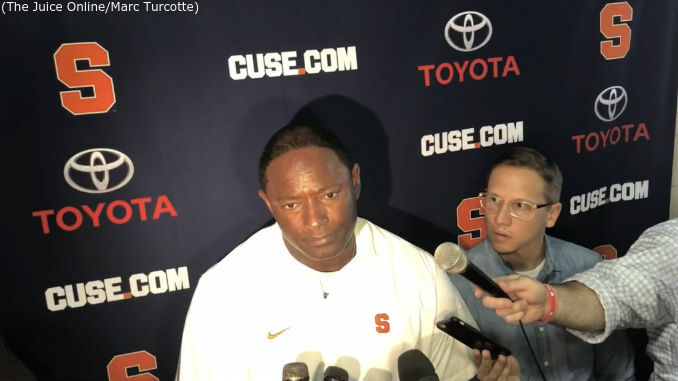 Syracuse head coach Dino Babers speaks with reporters following the Orange's 27-23 loss to Clemson. Mandatory Photo Credit: The Juice Online, Mark Turcotte. Two fourth quarter touchdowns by Travis Etienne, his second and third scores of the day, wiped out a double-digit Syracuse lead, enabling #3 Clemson to pull out a 27-23 win. The Orange, who led for over 45 minutes at Death Valley, gave up the winning score with 41 seconds remaining as Etienne, who rambled for 203 yards on 27 carries, waltzed into the end zone from two yards out. Etienne carried the ball five times on the final Tiger drive, a 13-play drive of 94 yards that featured 12 runs and a lone pass that converted a fourth-and-six. The score kept Clemson’s record spotless at 5-0 and 2-0 in ACC play while SU dropped to 4-1 overall and 1-1 in conference action. Syracuse opened the game with a score, cashing in an 11-play drive when Andre Szmyt booted a 35-yard field goal just over five minutes into the action. Two plays later, the Orange had the ball back when Alton Robinson pounced on a botched Clemson handoff at the Clemson 30. The SU offense lost yards on the ensuing drive, but that was no matter to Szmyt. The redshirt freshman walk-on drove home a 51-yard field goal to double the margin to 6-0 with 8:26 left in the opening quarter. With under a minute to play in the first, the hosts got on the scoreboard. Travis Etienne carried the ball in from a yard out for a touchdown and the extra point gave the Tigers a 7-6 lead. Clemson had a chance to extend their lead on their next possession, but missed a 47-yard field goal. A couple plays after that missed kick, Eric Dungey threw a deep pass that Taj Harris hauled in over his shoulder and turned into a 51-yard gain to the Tigers’ 14. Three plays later, Dungey scored from a yard out to put the Orange in top once more. Szmyt tacked on the extra point to give SU a 13-7 lead midway through the second quarter. The following Clemson drive was a tough one for the hosts. In a three-play span, quarterback Trevor Lawrence was sacked by SU defensive tackle Chris Slayton, then knocked out of the game on another sack, this one by safety Evan Foster. The Orange took over with under five minutes left in the half and ate up most of that time with a 75-yard drive. Jamal Custis caught a 32-yard pass down the right sideline to get Syracuse near midfield. SU would reach the Clemson 14 before settling for Szmyt’s third field goal of the half, this one from 32 yards out, for a 16-7 halftime lead. Neither side would threaten on their first two possessions of the second half, but Clemson got two chunk plays on their third drive to set up a field goal to draw within 16-10 with just over four minutes left in the third quarter. Less than two minutes later, the Tigers cashed in on a Dungey interception with another field goal to halve that margin. The Orange got a huge break on the final play of the quarter when the Tigers muffed their second punt of the game and Custis recovered the loose ball at the Tigers’ ten-yard-line. Dungey powered into the end zone on fourth down with some help from his friends and Szmyt tacked on the extra point for a 23-13 lead with just over two minutes gone in the fourth. Clemson needed less than two minutes to rip off a 75-yard scoring drive, notching a touchdown and extra point to pull within 23-20 with over 11 minutes on the clock. Syracuse crossed midfield on the following possession and, when faced with fourth-and-one from the Clemson 43, opted to go for it. Dungey lofted a pass to tight end Aaron Hackett, who hauled in the pass for a 19-yard gain. The gutsy call was wiped out, however, by an ineligible receiver flag and the Orange punted instead. After both teams punted once more, Clemson took over at their own six-yard-line. The Tigers racked up three first downs, but then faced their own fourth-and-six at their own 48. A 20-yard completion brought them into field goal range, but that was not enough. The hosts ran five more times, reaching paydirt with 41 seconds to play. The conversion extended the Tiger lead to 27-23. SU quickly wiped out any chance of a comeback with a pair of mistakes. Following a touchback, a holding call moved the Orange back to their 13. On the next play, an unblocked pass rusher smashed Dungey at the Syracuse five-yard-line and the Orange called time out with 18 seconds left. All Syracuse could muster from there was a pair of completions that would have resulted in turning the ball over on downs had the clock not run out. Eric Dungey connected on 26-of-40 passes on the day for 250 yards. Dungey was intercepted once, but offset that turnover with a pair of rushing scores. Devin Butler, Jamal Custis and Moe Neal each had five receptions for the Orange with Custis logging a game-high 73 yards. The Orange ground game was stifled throughout the contest, as wide receiver Sean Riley’s 24 yards on two carries led the team. The longest carry by any running back was six yards. Jamal Custis and Alton Robinson each had a fumble recovery while Trill Williams intercepted a pass. Kendall Coleman had a pair of sacks among his seven tackles while Evan Foster and Chris Slayton each logged a sack, as well. Ryan Guthrie and Kielan Whitner paced SU with 11 stops apiece. Syracuse will be on the road for the second straight week when they travel to Pittsburgh next Saturday. The Panthers (2-3, 1-1) have dropped their last two games, including being routed at #13 Central Florida, 45-14. The Golden Knights more than doubled Pitt’s yardage in the game, including torching the Panthers with four touchdown passes. Quarterback Kenny Pickett has only thrown for 743 yards in five games with five touchdowns and four interceptions. Qadree Ollison leads Pitt with 404 rushing yards and four scores. The Panthers have given up 38 points or more in all three of their losses on the season while averaging under 20 points per game against FBS opponents. Kickoff will be at 12:20pm Eastern on Saturday. The game will be televised in certain local markets by Raycom and will also be available at ESPN3.com.